Pamela R. Durso & LeAnn Gunter Johns, eds. 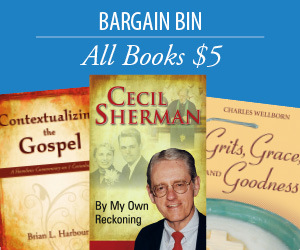 This is a remarkable collection of sermons. The Baptist world has been needing these voices for a long time, and thankfully these are women who could not wait to proclaim the Gospel. They offer a more comprehensive view of God, who has been urging them to speak all along. Hope for the church and the world is alive and well in the words of these gifted women. Keen insight, delightful observations, profound courage, and a gift for communicating the good news are woven throughout these sermons. The Spirit so evident in Addie’s calling clearly continues in her legacy. Pamela R. Durso is executive director of Baptist Women in Ministry in Atlanta, Georgia. LeAnn Gunter Johns has served as pastor of St. Clare Baptist Church in Macon, Georgia and New Community Church in San Jose, California. The words of these preachers are true to the Spirit of Christ and a sense of calling that comes from God’s heart to theirs. I celebrate the gifts these sermons will release in the lives of the people who read them. It is an honor and joy to recommend The World is Waiting for You. In the words of Addie Davis, “the frontier is limitless in the realm of God’s spirit.” This exceptional compilation of sermons and reflections points us to the horizon of our shared future, ringing with the songs from a choir of dynamic, colorful, and faithful women. For just as they resound with resurrection hope, so too might we all feel the unbridled possibility of God’s spirit of Love at work among us! 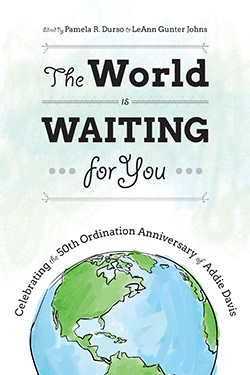 Half a century removed from the ordination of Addie Davis, there are still so many preaching voices we need to hear. I’m grateful for a book that amplifies some of them for us. The women preachers whose sermons are sampled in this volume speak of God more than they speak about God. They attend to the stories of the Bible and the stories of their lives with equal aplomb, inviting us to find our place in the story of God. There’s a kind of first-person-ness to their telling the good news, which reminds us that preaching is first and last witness. That too is good news.